Screens are becoming ubiquitous throughout our daily lives, and increasingly that includes in the places we shop. 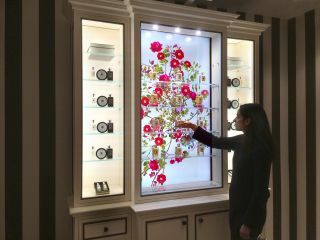 But as more retail outlets consider adding digital signage to their brick-and-mortar stores, they may need to consider that a simple screen with marketing messages might not be enough. New generations of shoppers are growing up in digital-first environments, and in part that means they have higher expectations about the way they experience screens in all environments. The first quarterly report from retail innovation group HighStreet Collective shows that some of the technology expectations that shoppers have inside stores support this idea. Things like touch/gesture technologies, mobile interface, and, importantly, data tracking (described as “the conscious willingness of shoppers to allow brands and/or retailers to use technology to use their data to enhance the experience, or receive value in exchange”) have become increasingly mainstream with shoppers, according to the report. Creating a less static space in retail environments is further supported by a recent study by Harris and conducted by Eventbrite that showed millennials are more interested in spending money on experiences, rather than products. If done well, digital signage can transform a boring trip to the store into a fun event that a shopper might share with friends on social media. A big part of that equation in a successful retail digital signage installation is the reliability of the equipment. You can’t have a fun, immersive experience if the screen isn’t working.